« So, what explains student loan defaults? Though roughly 2/3s of full-time undergraduate students receive “discounts” (via scholarship and grants), there are still plenty of families out there (the other 1/3) who are willing and able to pay full price. Money would be left on the table if these list price buyers got the financial benefit of an across-the-board tuition decrease. It’s more efficient for colleges to tailor pricing to individual students. Think: haggling with your local car salesman. In technical terms, the process is called “price customization” … using discounts (i.e. scholarships and grants) to price each customer (student) precisely at their willingness and ability to pay. Think: airlines offering first class, business class and economy seats at different prices. Administrators at Roger Williams University in Bristol, R.I., had pondered a tuition cut, but instead froze tuition last year after market research suggested families overwhelmingly preferred a high sticker price and scholarships over a low sticker price with no aid. Increase the price of complementary products. 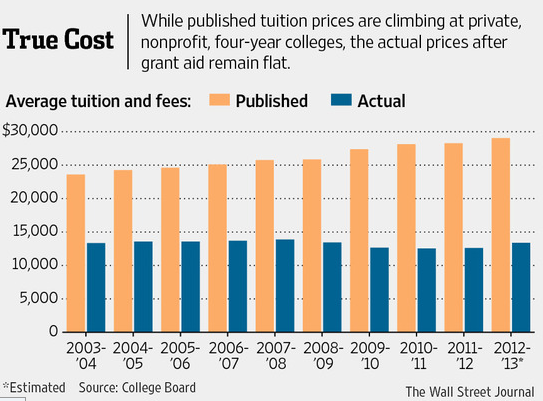 A few institutions cutting tuition rates are simply increasing room and board prices. The stakes are especially high for small schools, he added, since losing even a few students can harm the bottom line. Concordia University, St. Paul estimated it would have to add 24 more students this fall to break even on its recent 10% tuition cut. Sewanee, the University of the South, in Sewanee, Tenn., reduced its tuition by 10% two years ago after nearby state schools in Georgia and Tennessee landed students it had courted. Enrollment had crept down, along with the number of full-paying families. Sewanee’s freshman class grew to 433 from 401 in the fall of 2011, the first year of the new pricing plan, while the discount rate dropped below 40%, and the share of full-paying families topped 30%. Freshman enrollment hit 488 this fall. Jos. A. Banks style buy 1 and get 3 free? This entry was posted on April 8, 2019 at 6:59 am and is filed under Uncategorized. You can follow any responses to this entry through the RSS 2.0 feed. You can leave a response, or trackback from your own site.